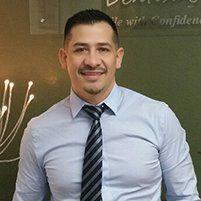 Dr. Zamora provides advanced teeth whitening services with the Pola System to brighten his patients smiles. Patients from across San Francisco can visit his modern and comfortable office in the Mission District to have dental discoloration removed. Consumed substances like coffee, tea, wine, berries and cigarettes are the biggest causes of tooth discoloration. In some circumstances, staining can be internal, which is usually caused by tooth trauma, prolonged use of certain medications, or root canals. Internal staining does not usually respond to traditional whitening treatments. Your dentist will examine and clean your teeth thoroughly to recommend the best treatment to brighten your smile. Can Whitening My Teeth Damage Them? Professional whitening services will not damage your teeth. Dr. Zamora only uses tested and proven whitening products and procedures that do not have any documented side effects. Some patients may experience temporary sensitivity to temperature, which can usually be managed and dissipates over time. What is the Pola Whitening Procedure Like? The dentist will always complete a thorough exam to make sure the teeth are in optimal condition for the whitening process. Then the teeth will be cleaned to ensure that no plaque will block the bleaching solutions. A flexible barrier will be fitted over the gums to protect them from the hydrogen peroxide solution. Then the dentist will apply a thin layer of the whitening gel using a thin syringe. With the Pola Whitening system, the gel does not need to be light activated and only takes about 30 minutes to noticeably whiten and brighten a patient’s teeth. In addition to the speed of the process, there are other benefits to the Pola System. The whitening gel includes a desensitizing agent mixed in with the gel that reduces the post-treatment temperature sensitivity that some patients experience. This solution also has a minor nerve blocking effect during treatment which helps to keep the patient relaxed and comfortable. Will My Teeth Need Special Aftercare? Some patients may experience mild sensitivity after whitening treatment, but this is not common and will usually pass in a day or so. In the first 12-24 hours following treatment, you should avoid consuming the foods and beverages that caused the staining in the first place and not smoke. For ongoing daily hygiene, you should brush and floss twice a day as normal.